« Road Rage On A Florida Highway. Bikers Versus Car Driver. My Bike Backfires During De-Acceleration After I Installed Aftermarket Exhaust. Can The backfiring Be Minimized Or Eliminated? Published by Cyril Huze April 14th, 2016	in Customs, Editorial and Exhaust. Backfiring (or more accurately “afterfire”) is caused by unburned fuel/air mixture being ignited by the heat of the muffler. When the throttle is closed during de-acceleration and the transmission is in gear, the engine continues to rotate at a faster rpm relative to the throttle position. As a result of this engine rotation, more air/fuel mix is pulled through the carburetor or injector throttle body (dependent upon it’s ECM program). This mixture can then build up in the hot muffler and ignite. The bang heard is the sound of this fuel igniting after the throttle has been closed while de-accelerating. There are several other factors involved such as: ambient temperature, fuel additives, carburetor settings, ECU programs, alcohol enriched fuels, etc. that may also contribute to the “afterfire” condition. Sometimes it’s a simple old exhaust gasket leak that causes it. Own a Victory High Ball. My bike never backfired! Vision here. No backfire. X-HD must work for Harley. Ha, ha. X H-D. Stop your BS. X HD is just mad because he spent so much money on a slow bike, mods, and apparel that won’t help his bike be faster or reliable. Its all about the tune! Two Vics here. Both have aftermarket exhaust. One has never had this problem, the other had to go in for a dyno tune with PC-V and now it doesn’t do it either. X-HD’s wife left him for a Victory rider. ’13 victory xc here, stage one installed. Mine doesn’t backfire either. It was dyno tuned by the vic shop. I love it! My 09 harley sounded pretty good….l when it wasn’t in the repair shop. When my Vegas 8 Ball pops….it is just warning HD’s that the Lord of the Asphalt Jungle has arrived. X-H-D comment just backfired on him! Don’t know about Victory, but for Harley, install a Thunder Max (with correct MAP) and the problem will be solved. De-accellerating? What happened to decelerating? Steve Berg. Backfiring happens as soon as you are no more accelerating. It’s de-accelerating. The consequence is decelerating. X HD why did you feel the need to provoke the Vic riders? Is it your commie objection to competition in the American V-twin market? Is it your embarrassment that in every published “shoot out” between HD, Induan, and Victory that Harley is the slowest? Is it your seething anger that both Victiry and Induan have around 27% more Anerican-made parts on them than your precious pig -um, I mean Hog? 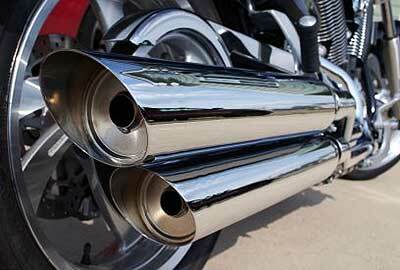 All bikes backfire at least a little once you out aftermarket exhaust on them. A well diale-in tuner and dyno can nearly eliminate it. I don’t really care if my bike backfires once in awhile, just like my chick doesn’t care if I fart once in awhile! Mike: it can be tuned/controlled if the bike is fuel injected because you have control of fuel delivery and ignition timing. You cannot control carb’d fuel delivery. There is always fuel present when carb’d even when decel. The best a guy can do w/carb’d is to jack the ignition timing to the moon at closed throttle/higher RPM (decel) but MAP sensing is a must to do this. With EFI, I can eliminate back fire pretty much entirely if it’s even present in the first place.